With the number of rail projects underway, it should be no surprise that there seem to be major works happening somewhere, every school holidays. In fact for the April school holidays there is so much going on that they’ve scheduled some works to happen beforehand, and labelled it an “autumn construction blitz“. And that’s leaving aside a host of evening and weekend closures affecting numerous other lines, as well as V/Line. On Friday some detailed bustitution flyers were released. They’re worth a look if you’re on one of the affected lines. You’ll find them via the PTV page or on Metro’s web site. One particular unfortunate change from previous shut downs is that recent infrastructure issues at Elsternwick now mean the entire Sandringham line is closed during works, even when they only affect South Yarra. As usual, it’s worth checking information before you travel, and considering alternative routes rather than assuming catching the replacement buses is the quickest way to get where you’re going. Last week some details of the Cheltenham and Mentone grade separations were released. Mentone: One thing I’m less than happy about is that the station entrance will be a long way from the bus interchange. Currently the buses stop right next to the entrance to platform 1. I hoped this might just be an issue with the artists impression. It’s not. Hi, we worked closely with transport agencies on the best location for buses & investigated a range of options. For reasons including not splitting bus stops, we are leaving the interchange where it is. There will be electronic displays to help guide passengers between services. Cheltenham: I haven’t had a close look at this one yet (there’s precious little detail on either, in fact) but they have gone ahead with the plan to include a third platform. The existing station has a third platform already. The difference is this one will be connected to the main line from both ends – enabling more operational flexibility. That why there are some references to a “third track” – this will not include an actual third track to Southland (to the north) or Mentone (to the south). Designs have also been released for South Gippsland Highway at Dandenong South (Pakenham line) and Evans Road in Lyndhurst (Cranbourne line). In both cases these are elevated road over rail – sky road! The problem with road over rail is it’s generally terrible for pedestrians, making them walk a long way in a hostile environment to get over the rail line. I don’t know the area well, but this might be more of a factor in Lyndhurst (mostly residential?) more than Dandenong South (mostly industrial?). Again, the lack of detail means it’s unclear to me if either of them include bike lanes over the bridges. They both seem to only have a pedestrian path on one side of the bridge, and on South Gippsland Highway, it’s not clear where the existing bus stops will be moved. If you’ve got feedback about the newly released designs, be sure to send it in via the Level Crossings web site. I am unconvinced that Cheltenham has a third platform. The limited-stops trains go there, but the actual third track ends at Moorabin. The placement of bus stops is getting worse, and worse. 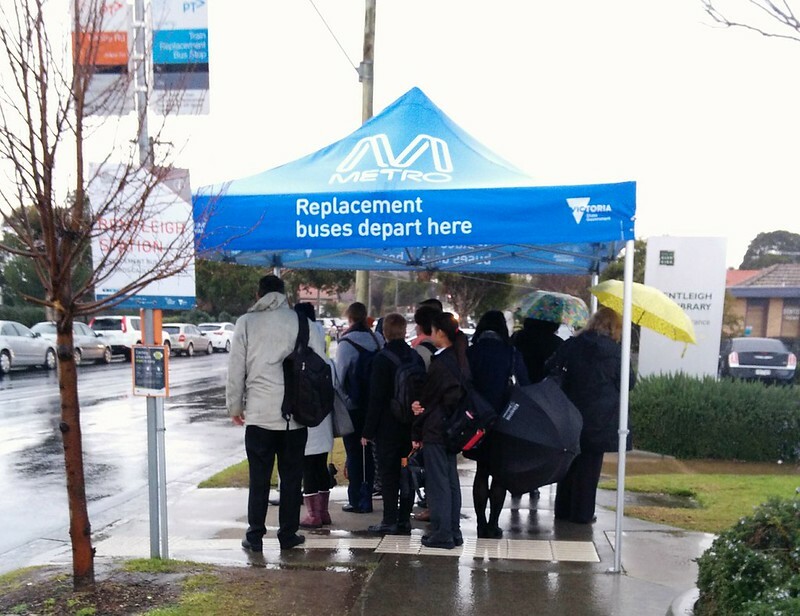 Poor placement of bus stops is the biggest shortcoming of the Frankston new station. The location of the 901 stop at the airport is pathetic. And I was very unimpressed by the location of the trackwork stop at Brighton Beach. Perhaps your mate at the level crossing authority could elaborate on what the reasons are for the very poor layout at Mentone. At none of the recent station rebuilds, has any attempt been made to expand the local ped-shed ( people within some arbitrary walking distance of the station . Often, the opposite. The designers seem to like vast spaces which are inconvenient for cars and inconvenient for buses and certainly inconvenient for pedestrians. The route of the 901 at Epping and South Morang leaves a lot to be desired. Long and tedious detours to 2 different stations on the same line… why ? The station at Mentone seems to have been moved 200 metres south from where the plan at the level crossing authority’s website shows it to be. I like the (deliberate?) ignoring of the point in the Level Crossing response: it makes interchanging between bus/train more inconvenient. 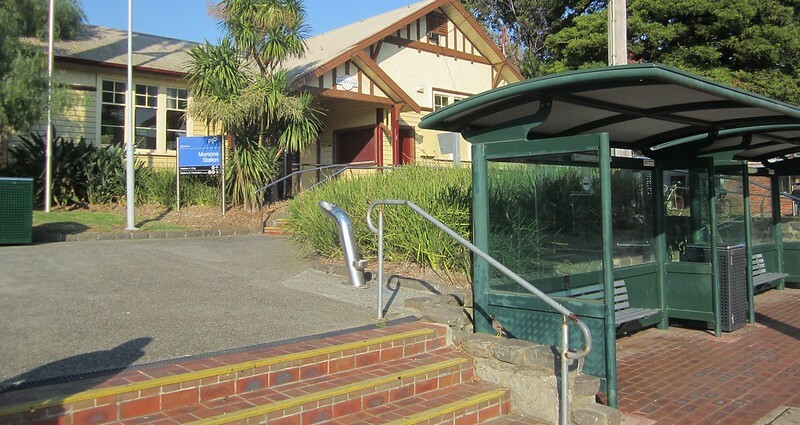 Harder to make a connection, further to cart/haul luggage, and further from services at the station – heated/air conditioned waiting rooms, security, toilets. ‘Electronic displays’ won’t fix any of that. From the response, the most important reason seems to be ‘not splitting bus stops’. The image suggests that a real reason is that they are prioritising a ‘kiss and ride’ and taxi rank, or, even worse, a simple car park access. Cheltenham will apparently use the Blackburn track layout, so it will not be possible to terminate citybound services there during disruptions. With the notable exception of duplication on the Altona and Hurstbridge lines, the various LXRA works refusing to upgrade rail infrastructure in any way (and actively building out of futureproofing) is perhaps the worst long-term aspect of the project. I highlighted the Cheltenham problem two years ago and LXRA claimed land acquisition would be required, which I disproved in 20 minutes with MS paint. @enno, you might not be convinced, but Cheltenham certainly has three platforms. The third platform is a bay behind the Melbourne bound platform. Construction has already started. The section of Florence St. in front of the Kilbreda clock tower has been closed for several months, and will be a pedestrian plaza. In LXRA’s overview, this is obscured by the tower, but the large zebra crossing opposite the station entrance leads directly to it. In the same construction site is a building which the council bought and which is being altered to activate the new plaza’s edge with cafes etc (as if Mentone was short of cafes). The section of Mentone Pd. that abuts onto that is currently closed in one direction and is being rejigged. LXRA’s view does not correspond to what it used to be, what it currently is, or the council’s plans. Maybe the plans have changed. A partial ring road around the centre has been made using Davies St., with a new set of lights and roundabout, and has been open for several months. According to the PDF from Kingston, some (or all) of the buses move to beside Kilbreda, near the new station, and the current bus bays are replaced by angle parking for cars. This will certainly improve amenity there because at the moment the diesel fumes get trapped under the shop canopies. I think also this extra car parking means the LXRA don’t have to build a multistorey car park fronting Balcombe Rd. ; it does not appear in the renderings and the people in the apartments opposite were very unhappy at the prospect. I can’t say I’m altogether happy with the Mentone Renaissance design. I see no provision for cycling (I used to cycle there to do my shopping, but stopped when No Cycling signs appeared on all the approaches, and now drive). The distance for the large number of students who walk from Mentone Girl’s High, on the corner of Charman and Balcombe Rds, is now longer. The new station is also more distant from the row of medical suites on Balcombe Rd. I feel as a ratepayer the money spent on the new building is wasted and it should have been left as open space, as it originally was before being sold off by the shire/council early last century. Interestingly, the Mentone Renaissance plan predated the LXRA consultations. I don’t know whether the LXRA moved the station to fit in with it, or the council planners had sounded them out as to where the station might be. Very amusing seeing posters plastered all over Brighton Beach station warning of “major disruptions” to travel in April. The bustitution brochure is so complicated to read! They should have done it by line, not by date. Or at least a summary by line showing what is and isn’t running per date. Too easy to get it wrong this way. I cant see how to upload so go look. Latest plan for Cheltenham has Kingston taking over right up to the Chelt. Park boundary. This is so multiple 6 storey apartment blocks can be built next to and over the rail. All vehicle entry west side is eliminated. 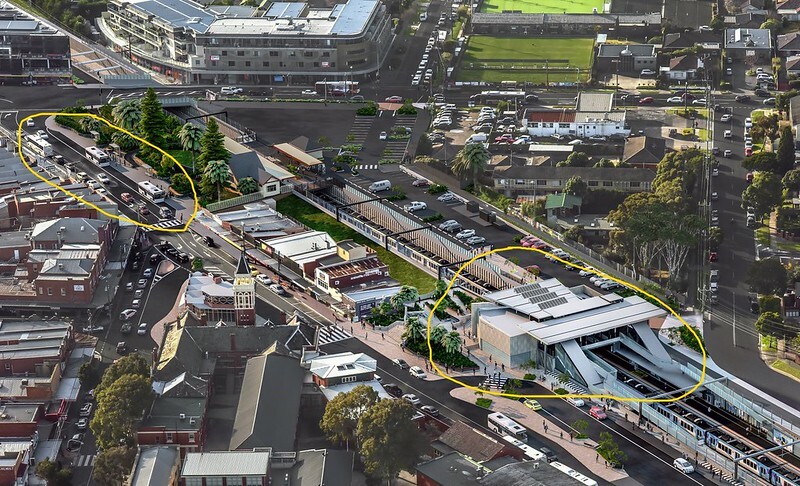 The existing 3 carparks 2 of which have multiple entries and “drive through” will be eliminated and Railway place becomes a “Shared Zone” entry/exit from Park Road. All vehicles to multi storey park, apartment blocks, drop offs, ubers, as well as bikes, scooters, pedestrians in the one “Shared Zone” The shared user path will be on the West Cheltenham park side. SUP will end North of Park road, with no connection through Southland and over Bay road. Western side access permanently blocked making Southland a stranded asset. There was a guy handing our pamphlets at Brighton Beach station this morning warning of major disruptions on the Sandringham line in April. No there won’t be! Two weekends does not constitute “major disruptions”. Who is responsible for this nonsense: the PTV, Metro or someone else? News articles on the two out Dandenong way said, this would make the lines as the first in Melbourne to be Level Crossing free. That is a mistake surely. While there is a plan, to remove all crossings from the Cranbourne line in the next 8 years, there are a lot more than just those two in the area. Evans road, could become a very handy Cranbourne bypass. You could then produce an almost straight line from Hallam pub to Pearcedale. Today, it is nothing more than a dirt road, of which is blocked off near the crossing. It cant be too hard to add the connection at Cheltenahm to enable Frankston end trains to terminate there in emergencies. If we need to acquire property, then so be it! And while I am here, why are we not making use of trams, especially between Caulfield and the city??? Trams between Caulfield and the City are very slow. The link in Fraser Gibson’s post above also has a download for the ‘Mentone Station and Gardens Urban Design Framework’ prepared for Kingston Council in January 2018. And there, on page 46, you will find a table with 3 options for the location of the bus interchange. The LXRA aerial view appears to correspond to Option 1. I interpret the LXRA’s Twitter response to Daniel to mean that they won’t be building Option 2, but either Option 1 or 3 remain possible. There’s a lot to read there and I haven’t had time. I find it disappointing that Kingston went ahead with major changes to the road network before this issue was settled. To take a random example, the part of Florence St. they’re turning into a plaza could have remained a road and gone over the rail line to connect to the Option 2 bus interchange and Swanston St.
@Roger, bear in mind that plenty of people catch trains on the weekend – here’s a Sandy line pic from last Saturday. For those people, replacing the entire line with buses will cause major disruptions. @Jim, an express bus can do Caulfield to the Arts Centre in about 30 minutes in peak hour. The number 3 tram is scheduled to take 43 minutes in morning peak, and you can bet it would be much longer given the congestion caused by the number of trams required to replace two major train lines. That said, I do wonder if they flooded the Sandringham line with services, how far they could push it to cope with extra passengers from the Frankston line, and likewise the Glen Waverley line covering for Dandenong (though in turn that would probably impact Alamein services). @Francis and Fraser, thanks very much for finding that stuff. Hopefully the council will push through a good outcome. if two weekends is a major disruption, why wasn’t there a guy handing out “major disruptions” pamphlets at Brighton Beach station in February and March? How come it wasn’t “major” then? Because two weekends is a disruption (a pain, for sure) – just not major ! Is it bustitution on V/Line, or coachstitution? I think V/Line must have forgotten that people actually travel to Geelong from stations other than Southern Cross – other than coaches picking up at Footscray, there are slim pickings even from Tarneit and Wyndham Vale that don’t involve possible setdown at all stations. From Deer Park, probably head backwards on a train to Footscray and get the coach. And none of the returning coaches sets down at Footscray – meaning a trip into Southern Cross and back out on the Metro train. Could V/Line make better use of Werribee as a coach staging point? Is this a forerunner of what a fast train timetable would look like (take the times and divide by two!)? Plenty of fast expresses and slow ordinary trains in between?